inkyloulou Designs: Feeling Very Special!!! 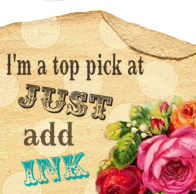 I'm feeling very special right now - my "Wild About You" layout got picked in the Top 5 at Just-Add-Ink this week!!!! Thank you so much girls, I really can't believe it! Also thank you to everyone who has left lovely comments on my blog x x x. I'm becoming a JAI challenge junkie and a blog addict - ha ha ha!! !